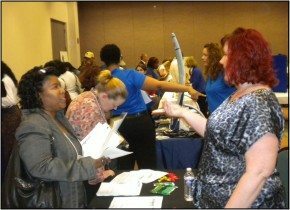 A job fair sponsored by the Catawba region’s three SC Works Centers — Chester, Lancaster, and Rock Hill — drew 952 job seekers to York Technical College’s Baxter Hood Center on Thursday, May 24th in search of job opportunities. Christine Turner, the SC Works Rock Hill Center’s Onestop Coordinator, and her team organized the four hour event. The fair focused on companies located in the three county region and was attended by twenty-seven employers with advertised job openings ranging from assembly, welding, warehousing, and operator jobs to customer sales and service positions. In addition to meeting area employers, participants were able to attend workshops that covered a critique of their resume, preparation for a job fair, procedures for expunging criminal records, veteran’s career opportunities, job fair follow-up tips for participants, and an employer panel that focused on what employers seek in potential job candidates. Computers were available for attendees to apply for jobs on-line. Chester County — 17%, Lancaster County — 13%, and York County—66%. Other regions and counties also had attendees as well — participants came from Camden, Winnsboro, Columbia, and Ruby, SC, as well as, Charlotte and Gastonia, NC. Companies attending the job fair were: Aerotek, UPS, ATI Allvac, Atlas Copco, Carolina Recruitment, City of Rock Hill, Guardian Industries, Haile Gold Mine, InChem, Lap Tech Industries, Agape Senior, Maclean Power, New Hope Carolinas, Nutramax Laboratories, Oerlikon Balzer, Oldcastle Building Envelope, Phillips Staffing, Principal Financial, Proctor & Gamble-Duracell, Resolute Forest Products, SC Department of Corrections, Sodexo for Piedmont Medical Center, Supermetal, TE Connectivity, and York County Endoscopy Center. The fair also provided attendees an opportunity to connect with SC Help representatives and apply for mortgage loan assistance if needed. United Way was a key sponsor for the Job Fair and was available to connect participants that needed services as they deal with unemployment. One employer summed up their experience at the fair, “this was an excellent opportunity to reach many interested candidates. My experience was great!” SC Works plans to host future job fairs in the near future.